If you already have a BDO account and you want to regularly check or monitor your savings account balance, you can do it without going to the physical teller machines. 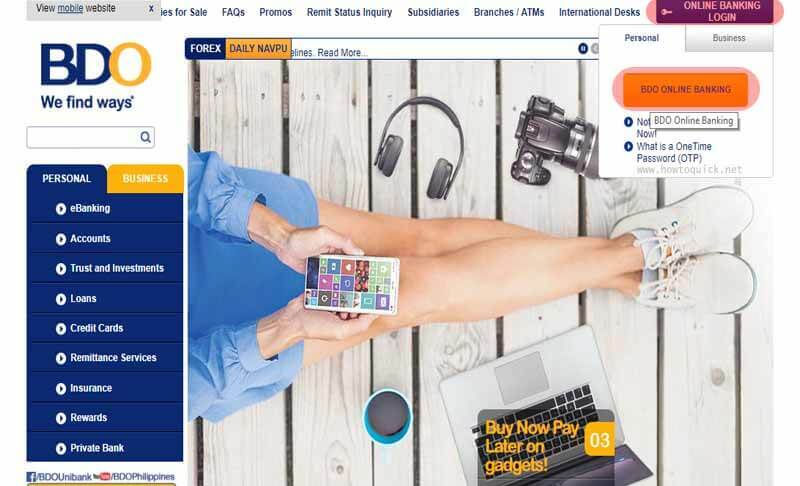 With BDO (Banco De Oro) online banking all you need is your mobile phone and internet connection to download and sign up for this service. After your successful registration you can benefit all the online services available on the mobile app menu. Using the BDO app (Android & iOS), you can do an online balance inquiry, fund transfer, pay bills, load your mobile prepaid, reload your cash card, send money and more. It’s a huge advantage to have this bank service right on your phone. Aside from saving your time, it also saves your effort as you can transact while on the go. 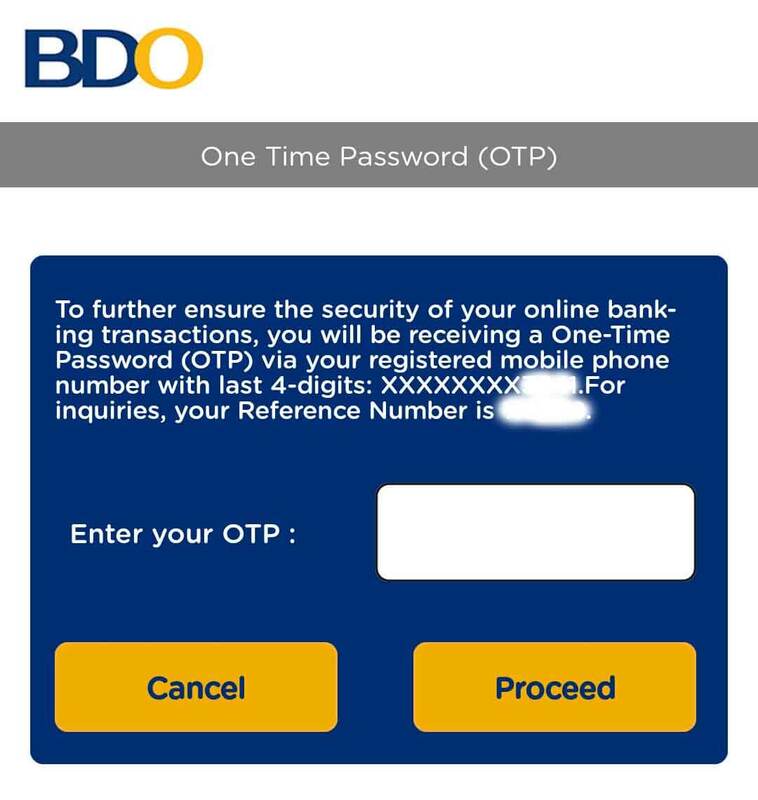 To link your BDO ATM, Savings, Credit card, personal or business account for online banking using the mobile app, you need to enroll or create an account via the BDO website. I suggest to use a computer or laptop for this one-time registration step. 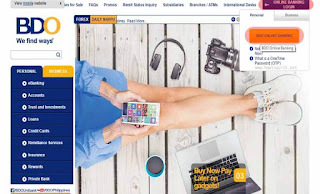 Go to https://www.bdo.com.ph/ BDO official website and click on Online Banking Login. On Electronic Banking Terms and Condition of Use page, read the content and check the box below if you understood and agreed on what is stated. Fill up the BDO online form page with the correct required details. Tick Within the Philippines if you’re in the Philippines and select Outside Philippines if you’re living abroad then select your country for verification. 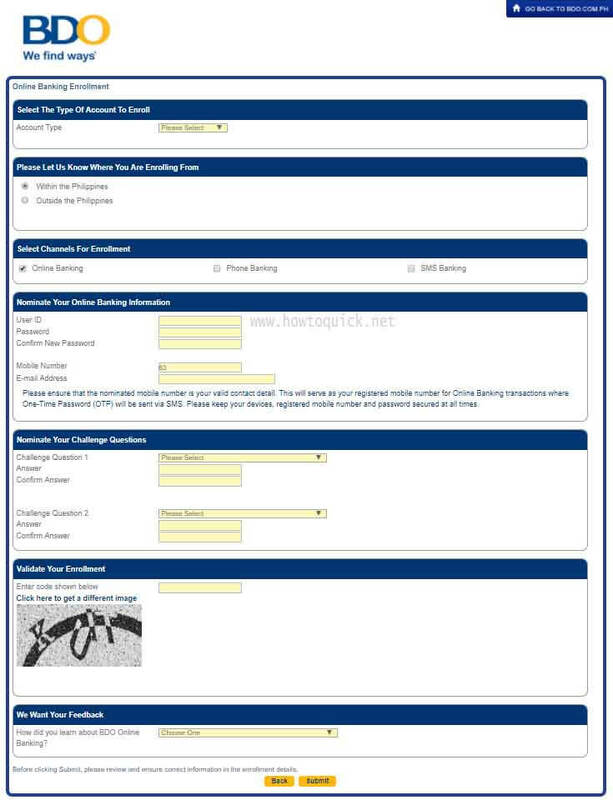 Select Online Banking on Channels for Enrollment. Input your account information. For ATM Card Number, it is the 16-digit number found in front of your ATM card. In Preferred Nickname, you can set your own name. For Online Banking Information, create your own account USER ID and Password. Be sure to write this down or memorize your ID and Password as it will be your login details once the registration is successful. Provide your active mobile number and email address for account verification and security. On Nominate your Challenge Questions, make sure to remember your answers as it will also use for verification in case of account security issues. 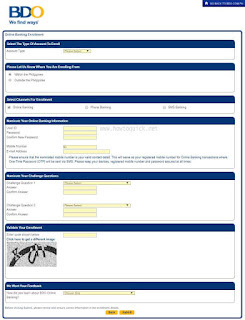 Type the captcha text to validate your enrollment and provide one feedback on the drop down list then click Submit. That’s it. The next page it the instruction on how to activate BDO electronic banking and the activation code. You can print this page or you can also refer to the SMS sent to your mobile number regarding the instruction of activation and the code. 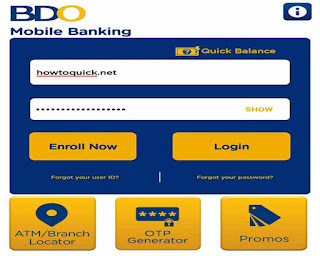 How to activate BDO Mobile App Online Banking? Go to any BDO ATM. Select Other Services, then Activate Electronic Banking and enter the activation code. Get the receipt and your good to go the next steps. 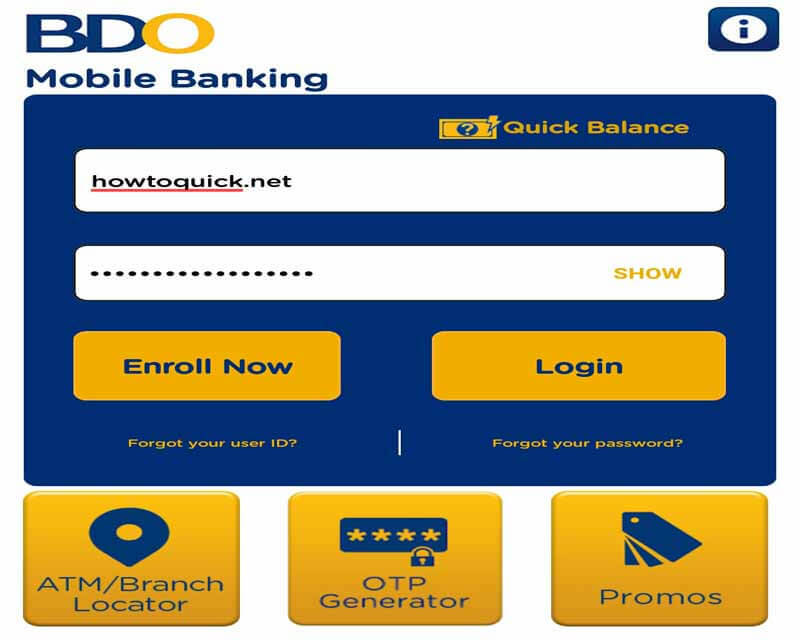 After the activation, you can now download and install the BDO Mobile Banking app for Android (Play Store) and iOS. Open the app, then log in the USER ID and Password you created, it will ask for OTP (One-Time Password) code. Just input the OTP sent to your mobile number with 5 minutes. If you still cannot receive the OTP code while logging in using the mobile app, try logging in using desktop or laptop computer first, then wait for the OTP code sent to your mobile number. Don’t worry if you can see “This account is inactive”, please wait for up to 24 hours to reflect the details of your account.